Once in Friday Harbor, it’s just a short drive to American Camp on the South end of San Juan Island. We were able to camp in the staff camping area by American Camp, but this isn’t generally a possibility, so most people should plan on either renting a cabin, a hotel room, or a campsite in one of the state parks. San Juan Island is also a totally doable day trip if you’re willing to spend some good time in your car getting back and forth to Anacortes. The San Juan Island National Historical Park on the island is split into two separate areas: American Camp and English Camp. Back in the mid 19th century, the treaty outlining the border between American and British territory was not made clear and no one was sure whether San Juan Island belonged to the Americans or the British. Britain’s Hudson’s Bay Company set up a sheep ranch on the island, while 25-29 Americans settled on the island as well. In 1859, an incident involving a pig led to actual conflict. Lyman Cutlar, an American farmer who had moved onto the island was extremely displeased to find a large black pig scarfing down tubers in his vegetable garden. This was not the first time this had happened. Cutlar was so angry that he shot and killed the pig. Later it was revealed that the pig was owned by an Irishman, Charles Griffin, who was working for the English Hudson’s Bay Company. Cutlar offered $10 to Griffin to make up for the pig, but Griffin was unsatisfied and requested $100. Cutlar argued that he should not have to pay anything because the pig had been trespassing on his land. British authorities then threatened to arrest Cutlar, and in response, American settlers called for military protection. Soon after that both Britain and America sent in troops to San Juan Island, but no shots were fired. Instead, both sides set up military camps on either end of the island and lived in them for about 12 years, socializing with each other quite often and having no real conflict. Finally, it was decided that an arbitrary commissioner should make the decision about the island and a German Kaiser was called in. After a year of deliberations, he ruled that San Juan Island would belong to the Americans. 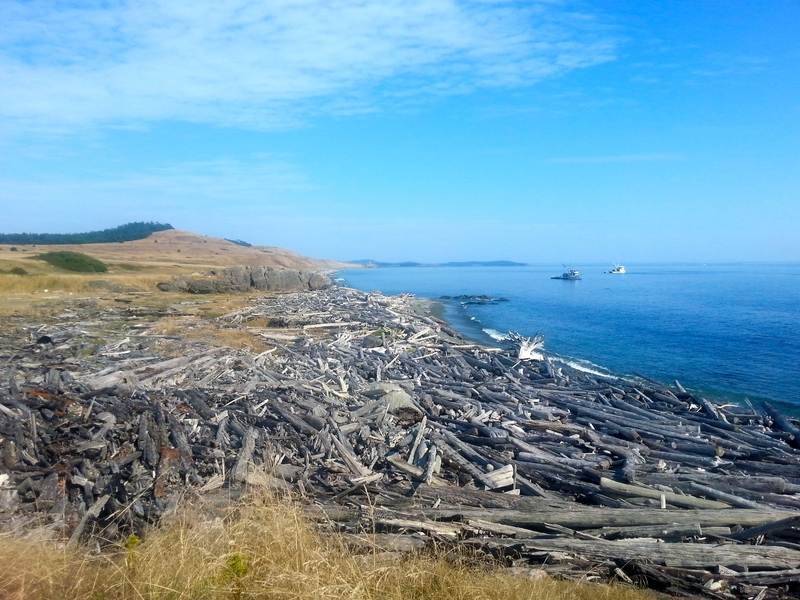 Now the old Military Camps together make up San Juan Island National Historical Park. If you’re lucky, Chief of Interpretation Mike Vouri will be in the visitor’s center at American camp and can give you a much more detailed account of the events. Mike was generous enough to give us an impromptu tour of the prairie. An orchestra of crickets and wind rustling the dry grasses and plants of the prairie accompanied our short hike to the beach. Yellow hills scattered with a few trees were visible in the distance. When we reached the beach we were able to get a good look at all the boats on the coast waiting for a signal to start fishing. Kelsey even spotted an otter taking a swim! On our tour Mike told us that he has been a ranger at San Juan for 20 years and is one of the leading experts on the Pig War. The park is now fighting a different war: one against invasive plant species. Believe it or not, the landscapes on San Juan Island are some of the last remnants of native prairies. We learned about some of the existing conservation programs that are taking place in the national park. Rangers are collecting native seeds and attempting to restore the prairies at American Camp to their native state. We helped to collect seeds and then to inventory the seeds that they already had collected. We also got to see their native plant nursery and learn about an endangered butterfly native to the island called the Island Marble Butterfly. Both camps are free to visit and have a few short trails for visitors to enjoy. American camp is larger and includes a gorgeous beach with views of the Olympics and, apparently, the occasional view of Mount Rainier. From American Camp, we were able to see the salmon fishing vessels and a beautiful sunset on our last night. English camp is smaller, but is also quite lovely. There’s a garden with several herbs, some good climbing trees and a trail up to a cemetery that has great views of the bay. Both camps include a small visitor centers and historical plaques about the Pig War and the area. They also both have some of the original structures that were used during the joint occupancy on the island. The town of Friday Harbor was pretty cute as well. From the ice cream shops to the seafood restaurants to the kitschy shops, it was a pleasure to explore. We especially enjoyed visiting the Griffin Bay Bookstore on Spring Street and may have spent almost an hour browsing the shelves and finding books that we just had to have. On our last day, we visited Lime Kiln State Park and Roche Harbor, two other destinations on the island. 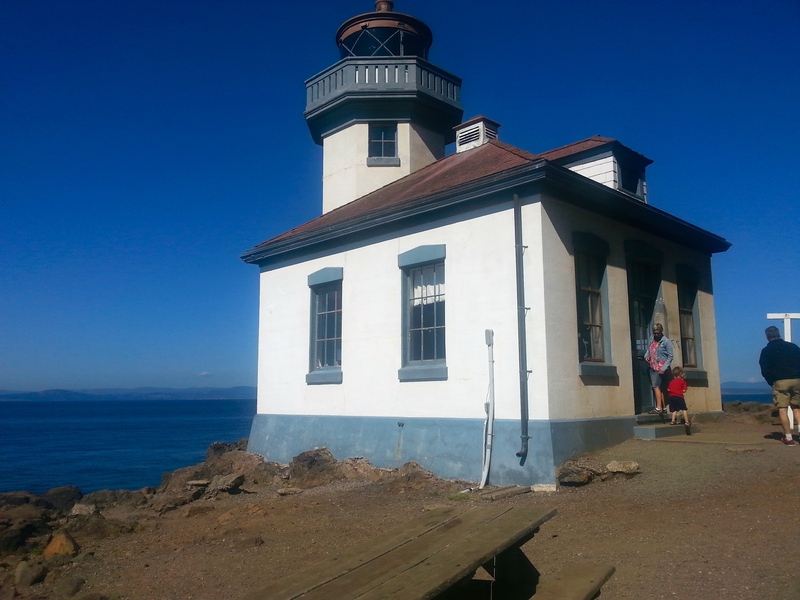 Lime Kiln State Park is a fabulous park and whale-watching destination on the west side of San Juan. I was amazed when I realized the land across the water that was very visible on this clear day was in fact Vancouver Island, BC. It was a cool feeling to be standing on the United States and looking out at Canada. Seeing the view brought back memories of visiting Victoria and Salt Spring Island with my family. The trail along the coast was also beautiful, circling Pacific Madrone trees and picnic tables, eventually leading us to a little lighthouse. Here are directions to Lime Kiln from downtown Friday Harbor: Go East on Spring Street away from the water and follow the road out of town. Go left on Douglas road and follow it until it turns into Bailer Hill road. After you go up and over Bailer Hill you will pass Wold Road on your right. Continue on Bailer Hill Road and you will see the ocean on your left. Follow it along the coast until you reach Lime Kiln State Park on your left! 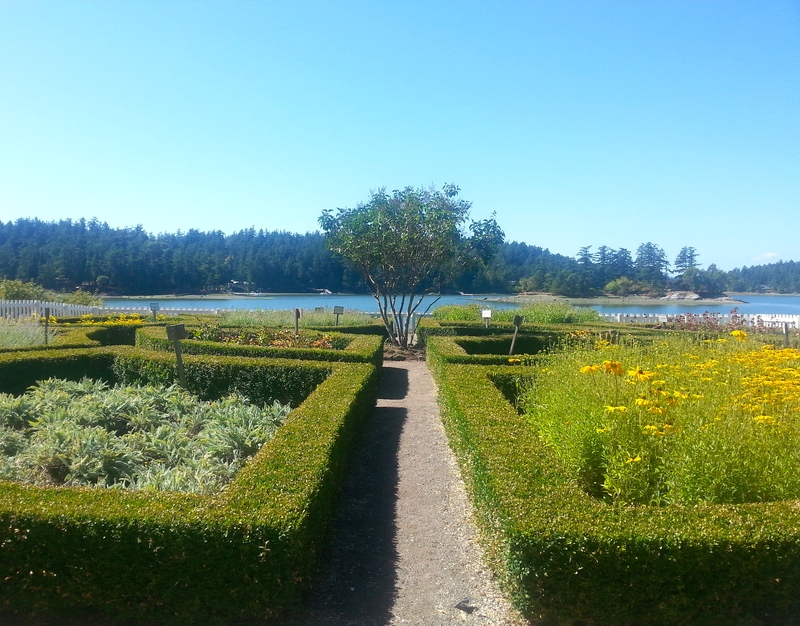 Although we did not spend that much time in Roche Harbor, we were able to get a glimpse at the beauty of the Roche Harbor Resort and its gardens. The pier had a few cute shops and on our way out we stopped at a few booths where artists were displaying their art. After exploring Roche Harbor we headed back to Friday Harbor and we were thrilled when we were able to make it onto the 1:50 PM ferry. We all bid farewell to the beautiful island; hoping to return again and let the adventuring continue. SCA Internships – this summer there were four SCA interns working at San Juan Island National Historical Park!